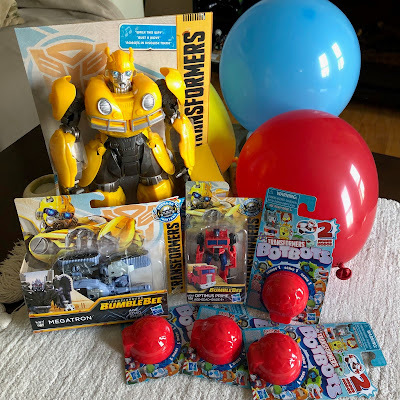 Posted in partnership with Hasbro Canada in celebration of the upcoming Transformers Bumblebee Movie. We received complimentary product to fascilitate our celebrating. Opinions and comments are those of the author. March is an exciting month at our house. We celebrate two birthdays during the March break and the two birthday guys happen to both be huge transformers fans. With the release of the new Transformers Bumblebee movie next month, what better way to celebrate than in Transformers Bumblebee style! We teamed up with Hasbro to bring our celebration to life with all-new toys from the Transformers Bumblebee movie! Need something to send the guests home with? Forget loot bags filled with items that will end up in the trash or sugary candy that honestly the kids don't need after cake. Here's a better idea, gift them with collectible Transformers Bot Bots (series 1) blind bag 2-in-1 mystery toys! Each mystery surprise comes with a 2-in-1 Transformers Bot Bots toy that transforms into a robot or everyday item! 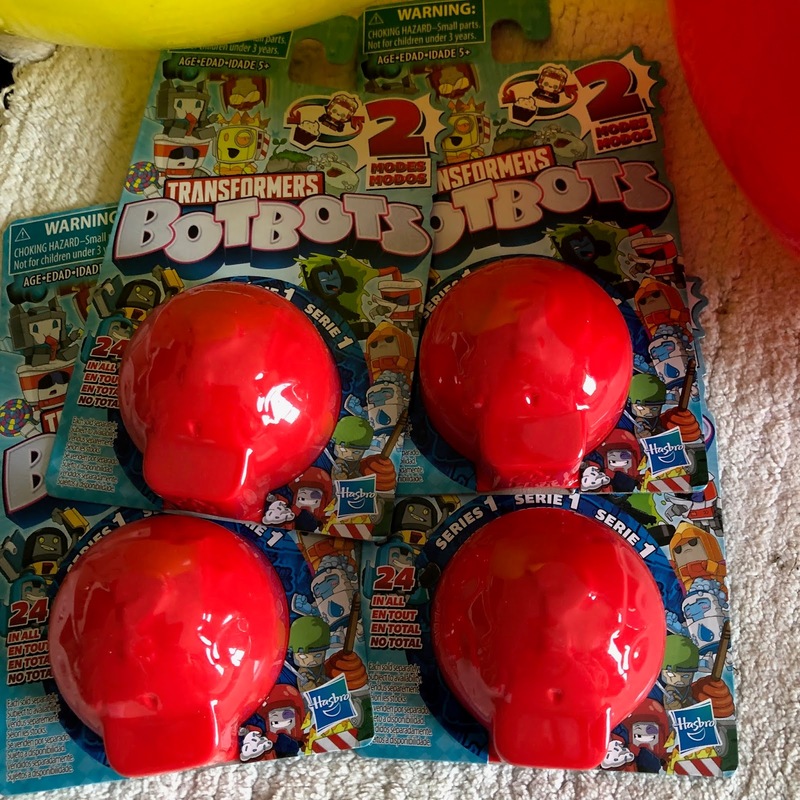 There are different ones like a refrigerator, a pair of scissors, a plant, a tree and a few other fun ones your party guests will love to start their own Bot Bots collection! Transformers fans alike will be thrilled with Transformers Movie 6 Energon Igniters Speed Series (we got Decepticon Megatron) and Energon Igniters Power Series (we got Autobot Optimus Prime) each Energon Igniters power and core (sold separately) work together igniting driving action! Really cool! The big kicker, the star of the show is Transformers Movie DJ Bumblebee. He's an interactive transformer that turns your voice into music with three prerecorded tracks to choose from. 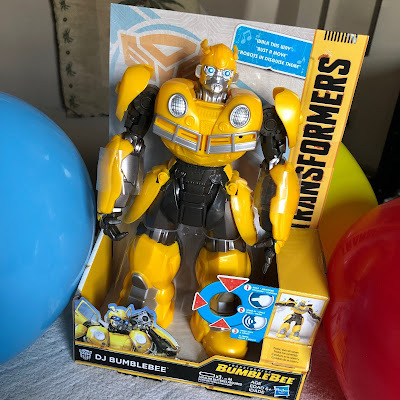 It's easy and super fun to get Bumblebee moving and grooving at any party! Press and hold his left leg to record your voice. Move his right arm to change the pitch of the recorded voice and move his left arm to change the song! Bumblebee may not transform into a car but he makes up for it as he moves and grooves to the music with his own cool Transformers dance moves. If you’re looking for gifts for the transformers fans in your life, I recommend checking out the new line from Hasbro at Walmart.ca! You didn’t think we’d celebrate without a gift for our awesome #AMEblog readers, did you? One (1) winner. Canadian residents only, all others will be disqualified. Please note if you win please reply to the winning email as soon as you can because #AMEblog giveaways work with great sponsors who are excited to ship you your prize! 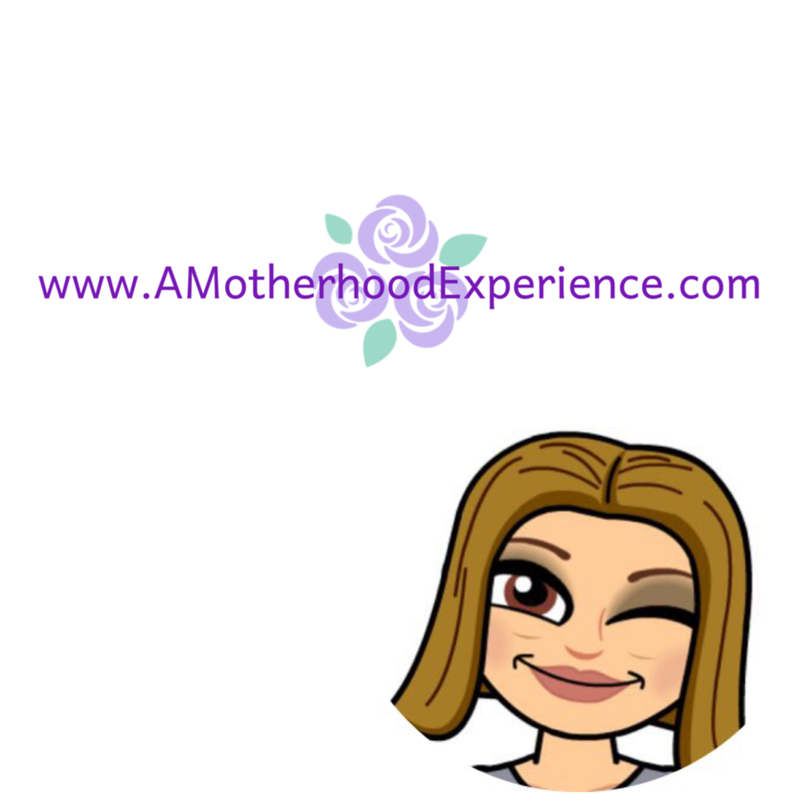 This giveaway ends March 31st, 2019! Please see the giveaway guidelines section for the legal stuff. Good luck! Optimus Prime has been my favorite. I remember when the toys first came out and I had a hard time to find the transformer for my son. I've always liked Optimus Prime as hes a good leader. My son loves Optimus Prime! My boys love Bumblebee the most because of the movie but my favourite is Optimus Prime - I'd like to have a cool reason but its simply because he's partially red which is my favourite colour. I love Bumblebee because he’s a good protector. Optimus Prime is my favorite because he's the one I remember playing with as a kid. Okay so we like Megatron, why cause sometimes the bad guy needs some love to . Plus he is a strong character as well. I like Bumblebee because he looks good and has good character. My favorite transformer is Optimus Prime. I watched the show as a kid and now my kids like it too. Bumblebee is my boys favourite because they love the yellow and black striped car that he transforms into. My nephew loves Bumblebee because he loved that movie. I always liked Optimus Prime as a kid watching the tv show. My daughter & grandson both love Optimus Prime because he's strong champion. Bumblebee because he has a sweet heart! Thanks! Optimus Prime is our fave because he's strong and cool! I love Bumblebee because he has a great sense of humor! My favorite is Optimus Prime because he's the leader. Optimus Prime because he is a good leader. My oldest grandson has always liked Transformers. When he was younger he always gave me Bumblebee because he wanted to be Optimus Prime. So Bumblebee became my favourite. Bumblebee. He is cool and I like the colours. I will go with Optimus Prime because my son loves him the most! 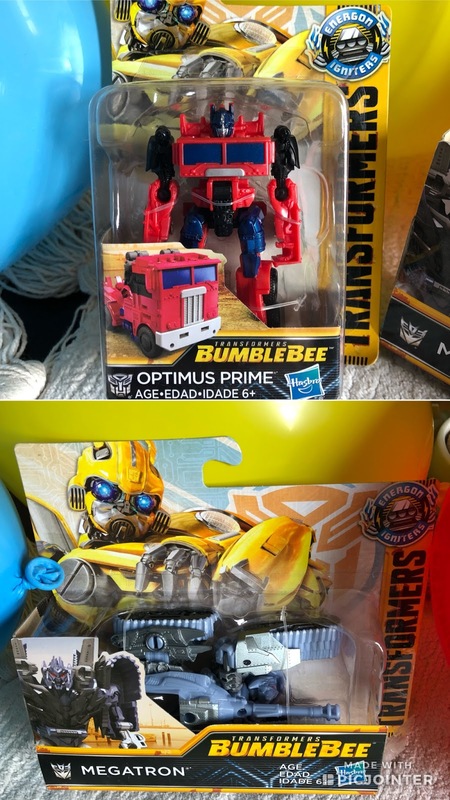 Love Bumblebee he looks out for others. Optimus Prime is my children's favourite. Bumblebee is my favorite because he is a great protector!!! Bumblebee because he is loyal and a great friend! I loved Bumble Bee because he was the one toy my brother would let me play with! Bumble Bee is our favourite as my Grandkids loved the movie! I haven't seen transformers since my kids were small. I'd love to see how they've changed, and be able to give them to my friends' children. We like Bumblebee for his choice of music! I have always liked Bumblebee, he is one awesome car!! My favourite Transformer is BumbleBee because I play with this all the time with my grandson and his eyes just brighten when we do! We like Bumblebee because he is a great friend. My favorite is Optimus Prime because he is strong! My favorite based on character is an optimist prime because he makes a good leader. Bumblebee is my favorite based on looks. Grandson's fave is Bumblebee mostly because he had a costume of him. I love Bumblebee. The character is very lovable as he is genuine and loyal. Optimus Prime has been my favourite because he's a good leader. I think Bublebee is cute. I love Bumblebee because of the movie!